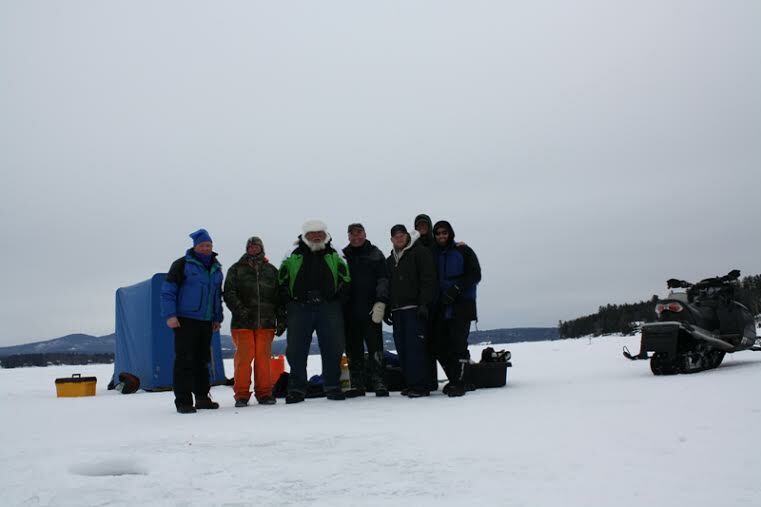 Every February in New Hampshire, ice fishers from all over gather for the Great Rotary Ice Fishing Derby run by the Meredith Rotary Club. This year the contest is the weekend of February 8 and 9. Anglers fish lakes and ponds up and down the state, looking for big fish to take to be weighed at Derby headquarters in Meredith. A great place to fish the Derby lies right outside the door of the Lake House at Ferry Point: Lake Winnisquam. This premier lake trout and salmon water also produces big rainbow trout and perch. Why fish the Derby? Ice fishing is a wonderful activity for kids. Children under 16 don’t need a license and there’s plenty to keep little folks occupied out on the ice. While watching tip ups, games can be played, skating can be done and snowball fights can be waged with abandon. Have a kid work a hole cut in the shallows and they’ll be rapt, face down, shading the hole to watch passing smelt, squealing with excitement as fish come in to nose the bait. Its also worth taking the kids to Derby HQ to see their eyes grow wide at the big fish on the leaderboard. 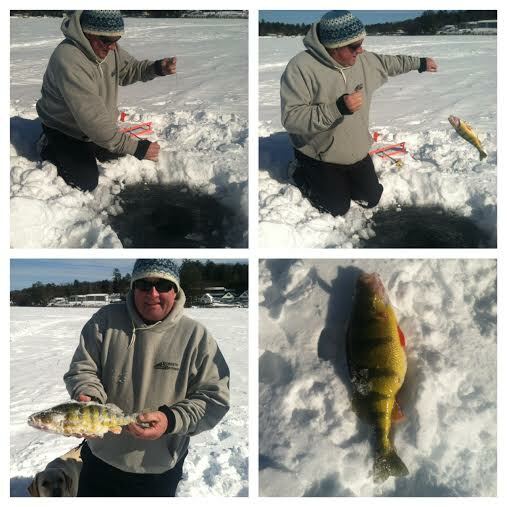 In addition, on Meredith Bay, NH Fish & Game holds a free ice fishing clinic for children, run by their “Let’s Go Fishing” instructors. Another reason to go: the simple, stark beauty of Winnisquam in wintertime. Sunrises and sunsets in frosty haze over acres of wide open frozen lake are dazzling. 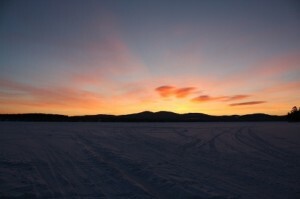 The crack and report of lake ice settling is the only thing that interrupts the deafening silence, save for distant laughter of anglers gathering for another day of fun on the lake… and maybe the echoing thud-wunk of someone working a “spud” or ice chisel. Pay close attention to the shallows early in the morning. Cut holes early, set tipups and keep a sharp eye. Winnisquam’s shallows team with bait fish, mostly smelt. These are prime food for trout and salmon in the lake. Rainbow trout, the prized fish of the Derby, love smelt. Finally, your Derby ticket, which can be purchased online or at area tackle dealers and shops or at Derby HQ, benefits Rotary charities. That’s a wonderful reason to get out and play, knowing that your fun is also for a good cause. Well over a million dollars have gone to area charities over the years thanks to the Derby. Oh… and one more thing, if you do catch a big fish, you could be in for a cash prize. Over $50,000 is awarded to anglers over Derby weekend… a little cake “icing” on an outing that’s easy to set up and always a blast on Winnisquam.